If thirteen random songs were picked from thirteen random CDs off of the thirteen (in reality, ten) shelves I have in my library, the album compiled together would be, odds on, a good representation of my musical interests. It wouldn’t be a complete picture and the styles and genres contained within this mix would range from one type to another. The same can be said of most anyone, though some people are more specialized than others. Mostly, I imagine that everyone had a diverse ear and that to assume that one person is straight up a single genre does them a great injustice. Ergo, what happens when someone makes an album that can accurately represent them? A good answer to that question would be Bradley Tatum’s It’s a Beautiful World. Contained in this collection of songs is music ranging from punk to electronic, industrial to elegant Victorian arrangements to goth dance rave fantastico. The album starts off with “Under The Storm Clouds,” a throwback to the 90’s goth-techno familiar to fans of VNV Nation, before shifting into a subtle electronica-versus-metal guitar track entitled “The Others.” The electronic is flavored with the 90s boon in the genre, but to confuse this for a straight up electric record would be a grave misunderstanding. 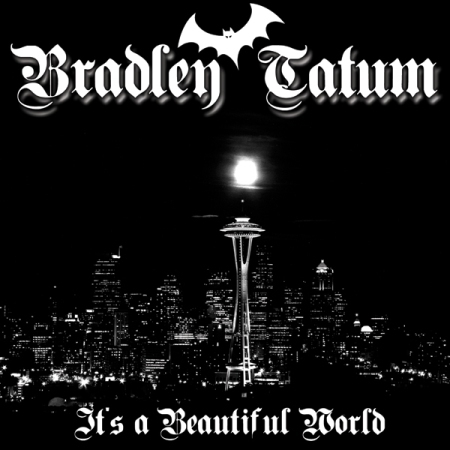 Bradley Tatum is the creator of the horror-punk label, Blood and Guts Records. But since closing the label to work as a creator and not just an overseer of other band’s music, Tatum has allowed his interests to flourish and experiment. The result is a body of work that frankensteins the many aspects of a life deeply involved in horror-music. The industrial-goth influence of the 90’s is felt throughout the album, though it’s less thrash and more dance. It’s hard to peg it down. A remix of “The Others” might be in your next goth club DJ’s rotation, the Baroque “Midgaard celebration” might be played at a Steampunk convention. In addition, the title track is an elegantly arranged electronic piece that might have been out of the seventies. It’s what Devo would have sounded like if Lou Reed joined DEVO right away instead of forming the Velvet Underground. I can see someone having a problem with the variety of It’s A Beautiful World, as the shift between guitar and electronic can be jarring for some people. It’s an album mixed, with melodic strumming bleeding from one track into another, while mechanical beats shift, pause and start up again. If one picks this up expecting one type of music from start to finish, they will be surprised. You’ll be surprised when you listen to it because you’ll find that you like at least one song. Then, you’ll hear aspects of it in another and sooner than later, you’ll find that all music is related. Bradley Tatum has shown you the way and you will be forever in his debt. Out of the two co-founders of Gravediggers Local 16, Strange Jason is certainly the one who is named Jason.